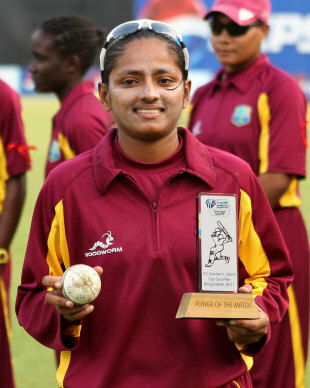 Anisa Mohammad displayed authentic spell of off spin bowling for West Indies Women and grabbed seven wickets enabling her side to win the prime match of the tournament against Pakistan Women by a huge margin of 130 runs. The ICC Women’s World Cup Qualifier – final, was played at Shere Bangla National Stadium, Mirpur, on November 26, 2011. The Carribeans Women Captain Merissa Aguilleira won the toss and elected to bat on the pitch which looked full of runs. The innings was initiated by Stafanie Taylor and Juliana Nero who gave them a rising start by providing 45 runs in 9.5 overs. Taylorwas the first batter to go back to the pavilion at that score with a personal contribution of 32 runs off 35 balls assisted with six fours. Shanel Daley replaced her and shared 31 partnership for the second wicket with consistent going Nero. Daley was gone after scoring 20 runs as Deandra Dottin joined at the crease with Nero who was playing well at the other end. The duo played absorbing cricket while securing their wickets and gave a tough time the rival bowlers. Pakistan Women Captain Sana Mir utilized six bolwers to dislodge the partnership and got rid of Nero but not before she had scored 63 runs. The 32-year-old experienced batter added 59 runs partnership for the third wicket and lost her wicket once the total had reached at 135 runs. The fourth wicket was gone after the addition of just six runs in the total when Stacy-Ann King entered in to bat. Dottin took charge of the situation and demolished the Pakistan Women attack by her aggressive innings and once again shared 94 runs partnership for the fifth wicket. The 20-year-old was unlucky to miss a deserving century by five runs and lost her wicket while trying to accelerate the innings. She smashed 95 runs off 83 balls with the help of seven well timed sixes and five rollind shots to the boundary. West Indies Women thrashed 250 runs for the loss of just five wickets at the end of the allotted 50 overs. Bisma Maroof was the chief wicket taker with two while Sadia Yousuf and Asmavia Iqbal shared one wicket each. Pakistan Women had a dreadful start as they lost their first wicket at 16 runs when Nida Dar was gone after scoring two runs. Qanita Jalil and Marina Iqbal steadied the innings and shared 49 runs partnership for the second wicket before the later lost her wicket for 16 runs. Qanita Jalil was holding one end as the wickets kept on falling at the other end against the lethal bowling of West Indies Women especially Anisa. Qanita was the fifth batter who went back to the pavilion after scoring 53 runs off 61 balls which comprised 6 fours. Nain Abidi and Sana Mir showed some resistance in the middle order by contributing 20 and 17 runs respectively before the entire team was bowled out at 120 runs in 37.3 overs. Anisa was wrecker in chief for Carribeans Women by grabbing seven wickets for mere 14 runs in 8.3 overs,Taylortook two wickets and Daley chipped in with one wicket. West Indies Women won the match comprehensively with a substantial margin of 130 runs while Anisa Mohammad was declared ‘Player of the match’ due to her magnificent bowling spell. Shahid Afridi: Boom Boom! Clap! Phus! Is Virat Kohli back in form? Cricket and Bollywood – A sizzling affair indeed! I think HPCA Stadium in Dharmashala and Galle Stadium should also be included. It would be great to have the quizzes on a mobile app platform! Graeme Swann took 255 and there are bowlers here who took less than him? Can't remember your Password ?